Prepare the brownie as per the instructions on the box. Cool completely. Meringue: Add the eggs and cream of tartar to a mixer and begin whipping until you see soft peaks. Add the sugar by the spoonful and continue mixing until the meringue is firm and shiny. Assembly: Cut four or six circles out of the brownie and place one on each plate. Add one scoop of coffee ice cream to each. Pour the meringue into a pastry sleeve and cover the ice cream and brownie in it. Now you can place the pastries in the broiler for a few seconds, just to brown them lightly. Remove immediately and serve right away, this way the ice cream remains firm and doesn't melt. If you have a small blowtorch, use that to lightly singe the meringue. This pastry has to be made right before serving. You can have all the pieces ready, just put it together when you're ready to serve. Change the ice cream flavor for one you prefer: strawberry, pistachio, dulce de leche, etc. The foundation can also be vanilla or pound cake instead of brownie. 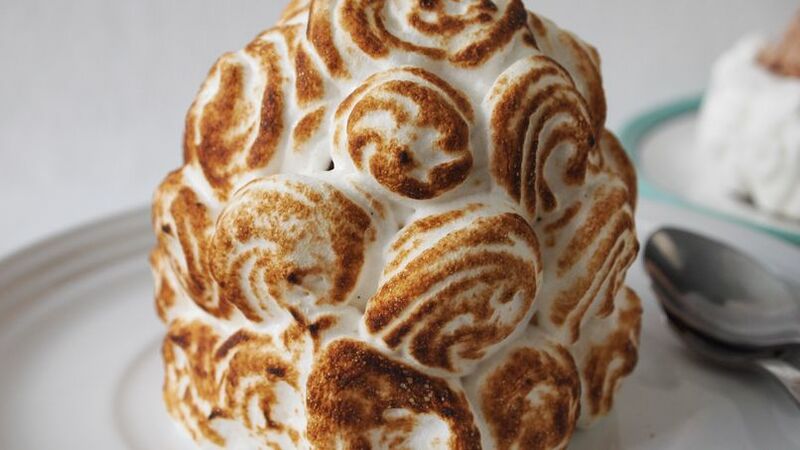 I've always been fascinated by Baked Alaska. This dessert used to be the gold standard at formal dinners. I remember that they would turn off the lights and all the servers, after picking up the plates from the tables, would come out with their trays filled with dessert covered in flames. They were all sprinkled in cognac and set on fire so when they reached the tables they had a golden brown appearance. The most incredible part came when I sliced into it with my spoon and right under where the flames once were – as they has now been extinguished – I would find a firm and frozen ball of ice cream. It intrigued me to think of how they did this so that the ice cream didn't melt under the heat, but it didn't cross my mind to think that the flames were nothing more than decoration that would singe the top layer of meringue. For me, it was magical. My magical childhood dessert is actually very easy to make at home. Without the showmanship that I remember, but still, very carefully and with few ingredients it can be done. If you follow the recipe word for word, you'll see that there's nothing mysterious or difficult about it. It makes the perfect addition to your Memorial Day celebration. I recommend getting everything ready ahead of time and simply put it all together last minute. If you don't have a pastry torch, I recommend heating up the broiler for a few minutes before serving. Place it under the flames. The idea is to give the meringue a nice golden-brown color without burning it. One more thing: You can make them in individual portions, like in this recipe, or you can use a rectangular mold to create one pastry to cut into slices. Have a wonderful day!